Since the early 2000s, scholarly attention for social dynamics around extractive industries in Latin American societies has boomed like the sector itself. 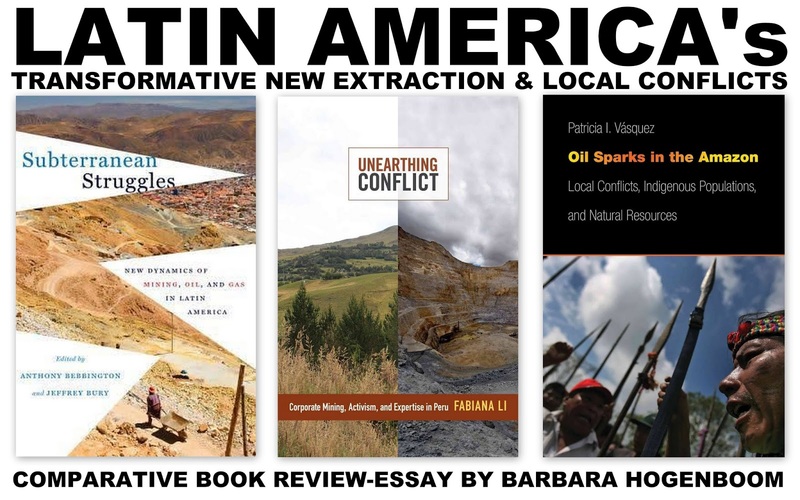 Next to the sector’s expansion and renewed political debates on its link to development, this increased academic interest is explained by the alarming rise of local conflicts over the extraction of metal minerals, oil and gas. Within this growing body of publications, the three books under review here are particularly helpful for understanding the nature and importance of these contemporary socio environmental struggles. The shift towards what Anthony Bebbington and Jeffrey Bury have labelled New Extraction had already started in the 1990s. Projects in the mining and hydrocarbon sector have become increasingly largescale, using new technologies, more sophisticated engineering and logistics, more capital, but fewer employees. In the case of new mining, also known as mega-mining among activists, huge open pits, extensive transport systems and high-tech treatment facilities (e.g. cyanide leaching in gold mining) affect large surfaces, including new regions and even countries (e.g. Ecuador). In the hydrocarbons sector, oil and gas extraction also enters new territories, in part helped by technological innovation that turns Argentina and Brazil into prominent energy producers with their respective shale gas and deep-sea oil reserves. The books discussed in this essay represent different approaches to the study of conflicts over extractive projects. Patricia I. Vásquez from Argentina is an expert on energy and sustainability. She analyses oil-related conflicts with indigenous peoples in the Amazon of Peru, Ecuador and Colombia. Fabiana Li is an anthropologist from the country she studies, Peru. She makes an in-depth analysis of the conflicts around the gold mine of Yanacocha, Cajamarca. Anthony Bebbington and Jeffry Bury have teamed up with a group of geographers like themselves from outside South America – people with a background in anthropology, journalism and activism who have made case studies on mining, oil and gas conflicts in Bolivia, Peru and Ecuador. Despite the focus of these books on the Andean countries, their contributions are of region-wide relevance. Patricia I. Vásquez opens Oil Sparks in the Amazon with the violent clash in 2009 between indigenous groups and security forces near the town of Bagua in the Peruvian Amazon. The groups were protesting against legislative changes that facilitate the sale of lands inhabited by indigenous peoples in order to enable the extraction of oil, gas and timber. As a significant share of Latin America’s undeveloped oil and gas reserves lie in the Amazon, indigenous peoples of these areas have increasingly encountered new projects that are threatening their territories and livelihoods. Although not all turned out to be as bloody as Bagua, where over 30 people lost their lives, conflicts over oil have intensified. Through extensive research including hundreds of interviews, Vásquez analysed 55 cases of oil-related conflict involving indigenous groups that took place over two decades (1992-2010) in the Amazon of Colombia, Peru and Ecuador. Instead of theory building, her analysis is aimed at identifying policies and interventions that can minimize local conflicts. Although the exploration of oil in Colombia, Peru and Ecuador started in the late 1800s, it took until the 1970s before Amazon areas became exploited. One major problem with oil drilling in these remote areas has been the absence of the state and the weakness of development policies and environmental protection. While some progress is being made, new socio-environmental conflicts continue to occur as the oil industry expands its frontiers into indigenous areas and indigenous groups realize that their cultural survival is at stake while receiving little in exchange. Despite recent international norms for indigenous peoples’ rights, huge inequalities remain in income, access to basic services, land ownership, and effective rights and decision-making power. On the one hand, the conflicts reflect the feeling among indigenous peoples that ‘they are being once again excluded from the benefits of economic development enjoyed by the rest of society’, (p. 3). On the other hand, the ‘conflicts around hydrocarbons also have become a means for indigenous organizations to assert their broader claims for a strong role in the political life of the nation and for the recognition of their cultural distinctiveness’, (p. 50). The core of Oil Sparks in the Amazon is focussed on the structural general causes of oil-related conflicts and the more transitory local conflict triggers. While the former are difficult to change in the short run, Vásquez argues that the latter can often be solved through a better understanding of the specific dynamics and by joint efforts of all the actors involved. While she stresses the distinction between structural flaws and conflict triggers, her analysis shows that they are intimately related and sometimes overlap, such as in the case of the many direct interactions between oil companies and indigenous peoples in the absence of government services and intermediation (pp. 65-66, 118-123). The overarching structural flaw lies in imperfect governance systems, especially poor subnational governance and gaps within legal frameworks. Under decentralization, the central government’s mismanagement of oil revenues was transferred to subnational governments that suffer even more from incapacity, arbitrariness, clientelism and corruption. And despite subnational redistribution of oil revenues, many conflicts occur due to an uneven revenue allocation between regions and communities. Moreover, while the central state is basically absent and the development projects of subnational governments do not satisfy peoples’ needs, local communities are forced to look for help from the oil company. What follows is a permanent process of negotiation – taking place within a legal void and under unequal power relations – between communities asking the company for basic services and the company demanding community consent in return. Only when this leads to conflict, as often happens, do state institutions step in as facilitator of company-community negotiations. Vásquez stresses that affected populations feel abandoned by the state and that conflict prevention requires constant instead of incidental involvement of central government authorities. The other main component of imperfect governance is diffuse and overlapping legislation. Constitutional notions of ‘national interest’ and the state’s ownership of subsoil resources clash with the concepts of indigenous rights and indigenous territories, and most oil-related conflicts involve indigenous land claims. To evade the weak and arbitrary national legal systems, affected groups have sought alternative legal routes abroad, especially in inter-American commissions and courts. Gradually, some domestic legal reforms have been made, but ‘[t]he fact that important legislation follows violent and sometimes deadly actions shows the limitations of democratic institutions to provide avenues for dissent and a general lack of attention to the condition of Indigenous populations’ (p. 79). Next to the unique role of the central state, solving and preventing conflicts is a responsibility of all actors, Vásquez claims. 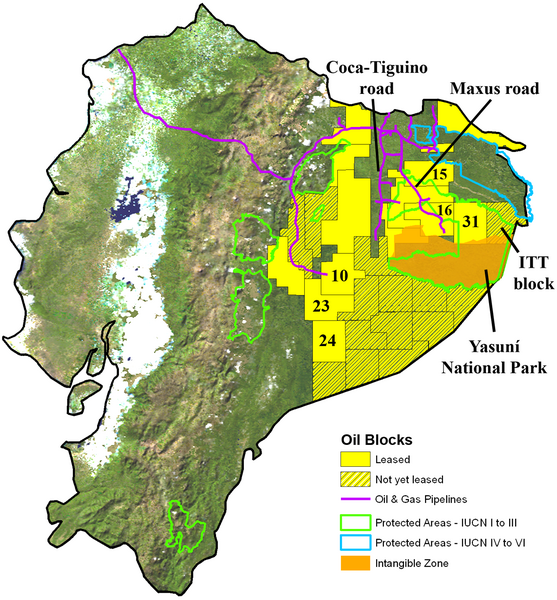 The four main local triggers or stressors of oil conflicts are divisions between indigenous organizations, difficult relations of indigenous organizations with other movements and NGOs, absent or inefficient institutional mediation (with Peru’s Ombudsman serving as the exception to the rule), and problems with Corporate Social Responsibility (CSR) implementation. Vásquez therefore advises strengthening indigenous movements’ capacity to monitor and negotiate with companies, mapping extractive areas for participatory decision-making on granting oil concessions, and designing governmental local development projects in a transparent and participatory way. Interestingly, while participation is presented here as a key solution, the book discussed next carries important warnings about some pitfalls of participatory mechanisms applied in practice. In Unearthing Conflict, Fabiana Li looks into the encounters of local communities with mining companies and governmental institutions in Peru, especially in Cajamarca. The story starts in the old smelter town of La Oroya, an example of so-called old mining, where the health-threatening pollution of air and water gave way to activism since the late 1990s. With the help of national and international connections, local activists made this pollution visible, and La Oroya became a wake-up call for Peru on mining risks. In contrast, the gold mine of Yanacocha in Cajamarca was presented as a break from the past. Starting in the 1990s, the company Minera Yanacocha promised to use modern technologies and a new model for environmental management and community relations. Nevertheless, a major conflict arose with campesino communities about the effects on the quality and quantity of water. As the area of concession consists of a large network of open pits within four different water basins, the campesinos depending on the limited water resources and existing community-build irrigation canals feared for their livelihoods and became mobilized. Based on extensive local research, Li offers both a rich inside story of the different actors and interactions in Cajamarca and a valuable contribution to theory building. Concerns of local residents over the ways in which water and land would be transformed were quickly countered by the company with environmental studies, water monitoring programmes, technical parameters and risk assessments. In the course of what Li stresses was a scientization of the conflict, engineers were hired to study the complaints of canal users, discrediting the latter’s perception of risks as not scientific. Both the company and state institutions constantly attempted to shift the attention away from social, ethical and political concerns by focussing on scientific studies, technological solutions and environmental impact. Yet the local perception of Cerro Quilish as a sacred mountain challenged this scientization. Many locals believed that this mountain near a newly planned mining pit is home to an aquifer as well as an Apu (a god). In their view, it is not a mountain or a resource, but a living entity. Companies and politicians alike were surprised by the novelty of other-than-human elements becoming central to the debate. As Li explains, in their transformation of mountains and lagoons, modern mining brought ‘things’ to the forefront of protests and politics in Peru. At the same time, the latent ‘indigeneity’ of the campesino community became politically significant as a result of the contestation against the plan to mine Cerro Quilish. In fact, the appellation Apu had not even been used by people of Cajamarca before the conflict, but as it had a better resonance, nationally and internationally, it was adopted by outsiders and journalists and then cultivated by local activists. Li correctly reminds us that neither local stories nor scientific narratives are fixed. They are transformed by interactions and contexts, which in turn transform them. Interestingly, the expanding perception of Cerro Quilish as an Apu posed a serious problem to the company and government that were used to justifying the new mine by pointing at the economic and utilitarian value. As Li argues, ‘the fact that Quilish was an Apu …’ – which I would say is not so much a fact but a result of the political dynamics and acts of framing that Li herself has demonstrated – ‘… made it incommensurable, in the sense it was irreducible to gold or other forms of material benefits’ (p. 122). The analysis of the interactions between campesinos, the company and the government with regard to irrigation canals brings Li to her interesting idea of contested equivalences. The term equivalence ‘refers to forms of expertise and technical tools used to make things quantifiable and comparable’ (p. 23-24) and the negotiation process over what counts as authoritative knowledge. To the campesino canal users, water quantity and quality mean different things than to the engineers hired to study and solve the issues raised by the users. However, their kind of knowledge usually does not count as legitimate, unless confirmed by scientific studies. The engineers hired by the company hold a ‘logic of equivalence’ in which water from a natural source is interchangeable with water from a treatment plant. In addition, in their eyes the effects of mining on the canals can simply be compensated with payments, temporary jobs and local projects. By looking at such equivalences, we see more clearly how in corporate and governmental approaches to solving conflicts many tensions remain beneath the surface, despite increased transparency. Although canal users were involved in the resolving water conflicts, the company’s compensation scheme for damages to the canal disrupted the system of water distribution established among canal users and created new tensions in the communities and even families. Scientific logic also dominated in the making of an Environmental Impact Assessment (EIA). After the participatory mapping of the terrain, the EIA would supposedly have turned into an objective source of scientific knowledge. However, the company itself is responsible for the legally required EIA – clearly an example of a self-regulatory regime – that is then shaped by a company logic whereby mining effects are considered as manageable risks for which technological and mitigation plans are put in place. EIAs do include several issues previously raised by activists in other mining conflicts, but companies ultimately define them. Increasingly, activism becomes focussed on producing scientific counterarguments against company-led assessments, and all parties in a conflict start to rely more on technical expertise and language, although anti-mining arguments of local groups are still easily dismissed as ‘belief’ or ‘politics’. The EIA’s participatory process creates collaborative relationships among the company, state institutions, NGOs and communities, but it also marks the space for opposition. Some activists have therefore refused to participate in order to not be accused of complicity in the final document and risks. This action, however, has its downsides as it can be viewed as undemocratic. Recent criminalization of protest by the state reflects this trend of institutionalization of ‘acceptable’ participation mechanisms. Finally, Li stresses the importance of keeping an open mind in the study of mining conflicts as they involve a mix of groups with different interests, views and demands, with shifting alliances and antagonisms. A local community does not have a common identity and new identities are produced in the context of social mobilization and interactions with the company and the government. Mining activities and company compensation repeatedly caused shifts in the social relations of community members, when, for example, some campesinos gave up farming and started small businesses, with varying success. As people are affected differently over time by the problems and opportunities posed by a mine, we should not think of stakeholders as fixed categories. Likewise, the relations between community members and the company are often ambiguous and can sometimes produce unexpected collaborations between the two. Subterranean Struggles is a recent contribution to the substantial ‘library’ of English and Spanish publications on extractive industries, conflict and development in the Andes that Anthony Bebbington and his group of collaborators and students have produced. This edited volume aims to contribute to the political ecology of the subsoil, which according to Bebbington and Bury, must be central to understanding Latin America’s transformations and its shifting geopolitical insertions. Geographically the focus is Andean, with seven of the eleven chapters presenting case studies from Bolivia, Ecuador and Peru. Discussing each case study is beyond the scope of the essay, so I will look into some of the book’s overarching lessons from the general chapters (1, 2, 10 and 11). By and large, they confirm and generalize findings of the books by Vásquez and Li. Subterranean Struggles argues for the importance of looking at struggles over the transformation of landscapes. These struggles usually start with enclosure of the subsoil for extractive activities, which gives way to the commodification and politicization of certain parts of the landscape. It is then often followed by struggles over access to the extractable reserve as well as the other resources that are going to be affected by the extractive process and related economic activities. 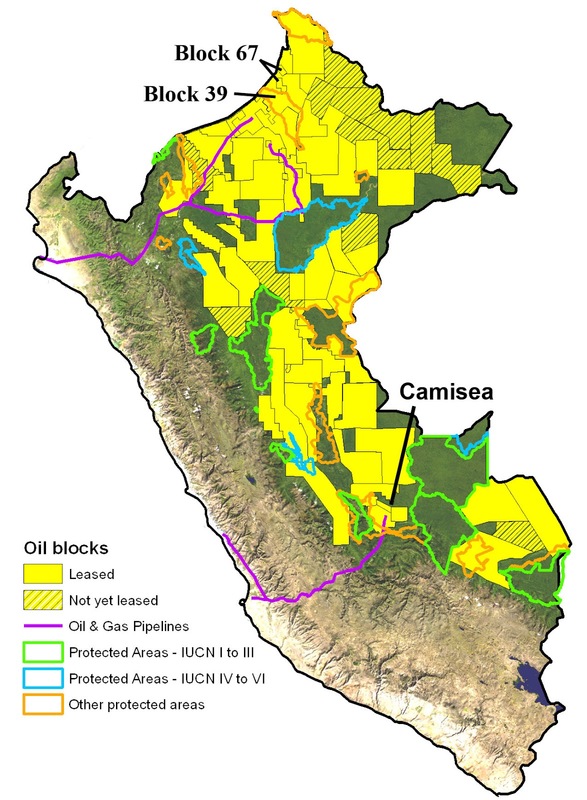 In a particularly strong contribution, Chapter 10 presents the results of a project on a range of Andean local conflicts around various large extractive projects, including the mining, oil and gas sectors in highland and lowland areas. This project evidences that the recent round of extraction has produced nothing less than a remapping of the Andes: national landscapes are reordered according to the visions of resource-led growth of the government and the strategies of extractive companies. The granting of new concessions creates overlaps in land use and governance practices (and also among different state-led projects), and produces uncertainties for local populations. In all cases, local people worry about the potential or actual loss of water and land, and of being dispossessed of a way of life and an ability to control space. Bebbington, Bury and colleagues warn, like Li, of the risk of simplifying and romanticising the struggle, and falling into the normative trap when studying local conflicts over extractive projects. Apart from subaltern groups trying to resist state and company plans, much more is going on, including struggles within communities and social movements. In most cases a multitude of groups and organizations is involved, operating in shifting alliances. And small-scale entrepreneurs and farmers, who are not necessarily marginalized and certainly not anti-capitalist, often lead mobilization, while the alternatives envisioned in their struggles are largely modern and pragmatic. While full opposition to projects is becoming more frequent, especially in Peru, most struggles are reformist, involving demands for better planning of projects, including territorial planning. The authors point out that next to dispossession, extractive projects also produce some opportunities, such as jobs, community development projects by companies, and especially more public sector funding due to the taxes and royalties paid by companies. Evidently, even such opportunities may contribute to conflict as they are often disappointing (e.g. employment) or create new inequalities (e.g. geographical unbalanced public expenditures). Simultaneously, part of the subterranean struggles is about complex and buried identities. Moreover, most case-studies reveal that part of the subterranean struggles is also about complex and buried identities. In effect, the book concludes that it is difficult to create a single analytical framework that fully captures the diversity of actors, motives and (inter-)actions driving these struggles. With respect to the role of the state, Subterranean Struggles coincides with many points made by Vásquez. The centrality of the state is presented as a key element of subsoil ecologies, linked to sovereignty and nation. The central state as the owner of the subsoil is pivotal in the control over and access to reserves on metals, oil and gas. Among its many strategies of dispossession, there is violence as well as discourses and framing. An example of the latter is the common presentation of natural resource extraction as the ‘natural route’ to development. This is often accompanied by legislative strategies, such as the use of presidential powers to declare large extractive projects to be in the national interest. The authors also mention the emergence of national development models based on the extractive sector as a motor for growth that generates social programmes and thereby the legitimacy of the government. However, no mention is made of the rise of new left regimes or the differences between progressive and conservative governments’ strategies (implicitly the authors seem to argue that development models based on the extractive sector is a region-wide trend across the political spectrum). Nor do they refer to Latin American debates on the development model and conceptualizations like neoextractivism or the Commodity Consensus by authors such as Eduardo Gudynas, Alberto Acosta and Maristella Svampa, who are missing from the bibliography. Recent and future trends of new extraction lead to regional transformation, Bebbington and Bury conclude. Increasingly large-scale extraction enabled by new technologies and financial capital coincides with large-scale infrastructure projects (especially IIRSA) that open new regions and countries for extractive industries. The culmination into a process of regional transformation is not coincidental. It was already imagined and planned by all kinds of actors: companies, consultants, governments, financial capital and regional organizations. In addition, the transformation is a result of new trends, especially a redirection of export flows and incoming capital with the rise of the economies like China, Brazil and India, but also a higher pace of economic activities and higher market volatility. As these new geographies of extraction produce new scales of uncertainties and risk, the scale of struggles over the subsoil is likely to grow. Although the social mobilization of the past few years has given way to more public debate over new projects, more CSR efforts of companies, and the adaptation of some projects, overall the authors come to the conclusion that the struggles over extractive activities have hardly affected the region’s large-scale transformation. For the near future, the end of a cycle of steepening demand for oil, gas and metals will lower the growth of extractive operations in Latin America, but the struggles are likely to continue. Among the reasons are the many vested interests of powerful corporate and state actors and the fact that previous protests have placed the problems of large-scale extraction under the spotlight. The new ideas, identities, strategies and institutional arrangements that have been developed over the past ten to fifteen years will partly run their own course, even if the growth rate of new projects slows down. Next to the numerous local struggles on which this essay has focussed, there are the national and regional discussions about the current development model in which the extractive sector occupies a central position. The possibilities and challenges of this model have been widely discussed in political and policy circles in the past few years, including the UNASUR, CELAC and ECLAC, but they have generally stressed the benefits and potential for future development. In recent academic publications, however, there is strong criticism about this model, ranging from warnings about the negative economic and social effects of reprimarization and deindustrialization (such as shown for Argentina by Giarracca and Teubal, 2013), the tension between an economic model of extractivism and a political model that aims to respect cultural and ethnic plurality (for instance Bolivia’s combination of an extractivist export model with plurinationalism, see Radhuber, 2014), and the unviability of a development strategy that can be seen as a new form of imperialism (as claimed by Veltmeyer and Petras, 2014). Furthermore, the books discussed here point out that the governance of resource extraction, or environmental governance, in Latin America is and remains a key issue for social and political debate as well as academic inquiry. For scholars there remain many steps to be taken in unravelling the complexity of governance, with the various multi-actor and cross-scale interactions and formal and informal practices and institutions to be taken into account, including their ambiguities. The ambiguous relations of local indigenous and campesino groups with state institutions illustrate this complexity well: on the one hand, local groups often demand a state that instead of being virtually absent will reduce uncertainty, guard against dispossession, and take back powers of governance delegated to companies. On the other hand, some struggles are about a fear of losing political authority over a certain space or (in case of indigenous groups) loss of relative autonomy, which may be caused by the power of a company, but equally by more control of the state when it responds to conflicts with new policies, institutions and interventions. Barbara Hogenboom is Associate Professor of Political Science at the Centre for Latin American Research and Documentation (CEDLA), University of Amsterdam, and managing editor of ERLACS. She coordinated the ENGOV project on environmental governance and coedited Gobernanza ambiental en América Latina (with Fabio de Castro and Michiel Baud, 2015, CLACSO). Giarracca, N., & Teubal, M. (orgs) (2014). Actividades extractivas en expansión: ¿Reprimarización de la economía argentina? Buenos Aires: Editorial Antropofagia. Radhuber, I. (2014). Recursos naturales y finanzas públicas: La base material del Estado plurinacional de Bolivia. La Paz: Plural & Oxfam. Veltmeyer, H., & Petras, J. (Eds.) (2014). The New Extractivism: A post-neoliberal development model or imperialism of the twenty-first century? London: Zed Books. Open Access review essay distributed under the terms of the Creative Commons Attribution 3.0 Unported (CC BY 3.0) License http://creativecommons.org/licenses/by/3.0/.